Guess who's celebrating two years with us? Remember way back when? 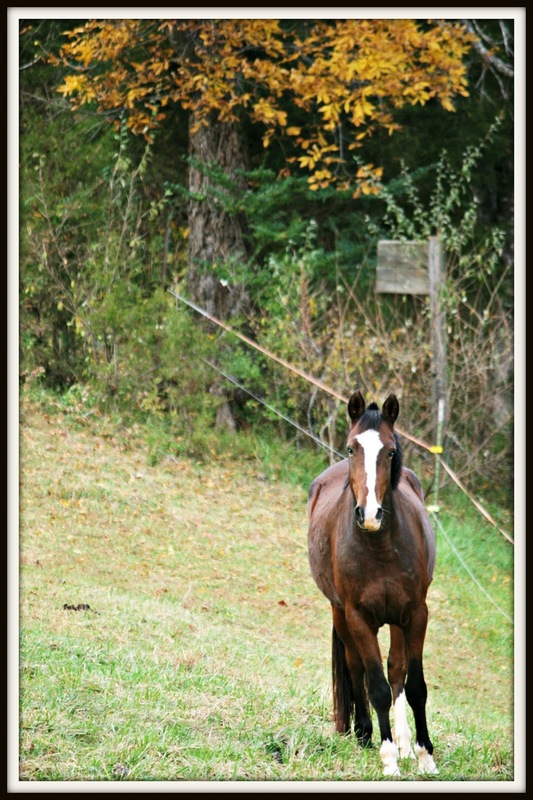 The bony, wormy, skittish and terrified mare that I brought home the day after Thanksgiving? Well here she is today. Look at that healthy belly! Yes, Francie is doing just fine these days. Enjoying more pasture time than riding time, with my busy schedule, but she seems happy and enjoys extra treats and following me down the driveway every morning when I get the boys on the bus. I know some of you have been following Francie's story from the beginning, so i do try to give an update now and then. I truly hope she doesn't remember much from her days before she came to Two Bears Farm. She's beautiful and looks very content! pretty girl! glad she's enjoying life with you! I'm glad you came to her rescue. She looks really pretty! I hope the previous owners have given up on caring for animals they can't take care of. The good life has paid off.Hope she provides someone a good ride. You are an amazing lady - a true heart AND Hero . .
She's beautiful. My daughter's rescue horse Seamus is thriving too. All they needed was a caring person. Those two horses got lucky. You have made her into a very healthy looking horse. Good job!! We always love these Francie updates!! She is sooo beautiful. No,, I do not think she remember anything before she came to live at your house! She's beautiful! So glad she found a good home with you. She's gorgeous and looks very healthy. You have done a great job, saving her life! It is so nice that you helped her get to a healthy state. You have done a deed of "Blessing Continuem." I remember when you rescued her. So glad she is thriving! HAPPY 2-YEAR- LOVE WITH YOUR NEW MOM, LISA & HER FAMILY!! YOU ARE IN GREAT HANDS HAVING A WONDERFUL & SAFE LIFE WITH THEM. I LOVE HORSES!! I LOVE ANIMALS!! MANY BLESSINGS IN THE YEARS TO COME WITH YOUR WONDERFUL FAMILY. I love seeing Francie's continued success story with you. And.. my horses spend far more time in pasture than under saddle, and that's just fine by me.. and them, I'm sure! Would love to see a before and after post of Francie - Then.. and now. The transformation is incredible. Way to go, Francie! You are a star for bringing her back to health and offering her an awesome home. and see that all goes well with you, your family, and horses. I just stop by to say hello to you all. Have a happy season with your beautiful boys & family, Lisa! Have a wonderful year 2017 to you all!